Your motor control centre will be supported with a customised documentation pack for your MCC. All information will be supplied in a single package. Generic product information is also available for download from this website. AuCom are the experts in motor control and we share our extensive knowledge with your team throughout the project and into operation. We offer product and application training to your team and other contractors according to your needs. Training is available at your site or at the AuCom factory. Our Support Engineers are on stand-by ready to assist with any technical questions you may have. 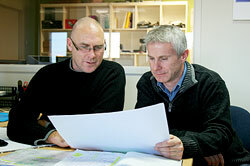 You can be assured that your enquiry will go straight to a qualified engineer with extensive experience. Support is available via phone or email (or site-visit if required). In the unlikely event of a fault or other issue AuCom Support Engineers are available to guide you through your logs and assist to isolate and eliminate any issues. Our engineers have access to selected diagnostic tools to understand precisely the conditions of the fault. In the event of a more serious failure, AuCom has on-site and off-site repair facilities, supported by spare part stocks. AuCom offers cradle-to-grave support for your motor control centres, to ensure increased reliability, safety and lower overall running costs. For existing or decommissioned MCCs, AuCom can advise an upgrade path or retrofit option that will make the most of existing equipment. Included with your product documentation, AuCom will provide a maintenance schedule that identifies key activities to maintain your MCC and extend product life, thus making the most of your budget. Spare parts are available from your local AuCom agent. AuCom offers a lifetime service contract for motor starters to provide peace of mind for all motor control centres, products and equipment supplied by AuCom.